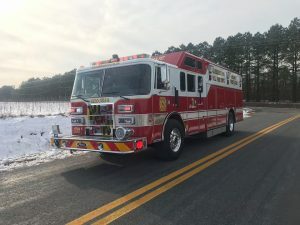 While the Chief and other members were in Wisconsin doing the final inspection on our new rescue, this writer was contacted by the Assistant Chief of the Allen Volunteer Fire Department in North Carolina, expressing interest in our current rescue. Once the members returned, contact was made with that department, which began a discussion, and ultimately set up a time for each department to meet face to face. 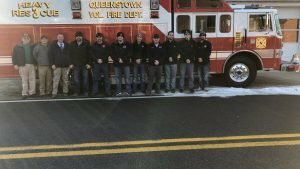 A group of members from the Allen Volunteer Fire Department made the 7 hour trek to Queenstown. After negotiating a price, a careful inspection of the rescue, and based on a favorable vote by our Board of Directors and general membership, we sold Rescue 3 to the Allen Volunteer Fire Department. We are sad to see her go, but we also know that she has plenty of good years ahead and will definitely be an asset in her new home in North Carolina.